Sometimes, we sing a song that has a line, “I am a friend of God, I am a friend of God, He calls me friend.” The song is happy and upbeat to make you feel good when you sing it, but it never touches upon what is required for God to call you His friend. This is a serious subject. We should not assume we are God’s friend. We must be sure we are His friend. These words were not spoken as a rebuke, nor even as a surprise. Jesus is encouraging us to become friends with Him, and He states three requirements for friendship. Jesus shows His love for us by laying down His life for us. He calls us to lay down our life for Him and others through love and obedience to Him. Obedience, love, and self-sacrifice are the foundation for being His friend. There is no other basis for friendship with God! True friendship is rare on earth. It means identifying with someone in thought, heart, and spirit. The whole experience of life is designed to enable us to enter into this close relationship with others and with Jesus Christ. Often, we receive God’s blessings and listen to His Word, but are we His friend? Are we obeying Him, loving others, and sacrificing ourselves for Him? To identify as a friend of Jesus, we must have the Spirit of Jesus. The fruit of the Spirit (love, joy, peace, patience, kindness, goodness, faithfulness, gentleness, and self-control) is always shown in Scripture to be the visible result of an intimate relationship with Jesus Christ. John 15:1-6 I am the true vine, and my Father is the vinedresser. Every branch in me that does not bear fruit he takes away, and every branch that does bear fruit he prunes, that it may bear more fruit. Already you are clean because of the word that I have spoken to you. Abide in me, and I in you. As the branch cannot bear fruit by itself, unless it abides in the vine, neither can you, unless you abide in me. I am the vine; you are the branches. Whoever abides in me and I in him, he it is that bears much fruit, for apart from me you can do nothing. If anyone does not abide in me he is thrown away like a branch and withers; and the branches are gathered, thrown into the fire, and burned. Once we abide in Jesus and become His friend through obedience, we begin to bear His fruit. The picture resulting from such a life is that of the strong, calm balance that our Lord gives to those who are His intimate friends. John 17:22-23 The glory that you have given me I have given to them, that they may be one even as we are one, I in them and you in me, that they may become perfectly one, so that the world may know that you sent me and loved them even as you loved me. Jesus was so intimate with the Father that they thought alike and acted alike. They are one and the same. Jesus only said and did the things He heard and saw the Father saying and doing. That is what a friend of God does—speaking and acting only as God, the Holy Spirit, directs. When Jesus prayed, He communed with the Father. That is what friends do—they talk, they share, they commune, they love spending time together and conversing. Think of the last time you prayed. Were you desiring something from God, or did you desire God? Was your determination to get some gift of the Spirit for yourself, or to get God? Were you trying to influence God’s will, or did you surrender your will to Him and try to become one with Him? Matthew 6:7-8 And when you pray, do not keep on babbling like pagans, for they think that they will be heard because of their many words. Do not be like them, for your Father knows what you need before you ask him. The reason for praying and asking is so we may get to know God better. Part of prayer is listening to God. Prayer is a conversation—a constant communion with God—not a wish list nor a cry of panic. We should pray to get a perfect understanding of God Himself and His will. Therefore, we should never stop praying—that is, communicating with God. Psalm 37:3-6 Trust in the LORD, and do good; dwell in the land and befriend faithfulness. Delight yourself in the LORD, and he will give you the desires of your heart. Commit your way to the LORD; trust in him, and he will act. He will bring forth your righteousness as the light, and your justice as the noonday. If we are saved and sanctified, God, the Holy Spirit, guides our everyday choices. And if we are about to choose what He does not want, He will give us a sense of doubt or restraint, which we must heed. Whenever there is doubt, stop at once. Never try to reason it out, saying, “I wonder why I shouldn’t do this?” God instructs us in what we choose; that is, He actually guides what we call “our common sense”. It is called “walking by the Spirit”. 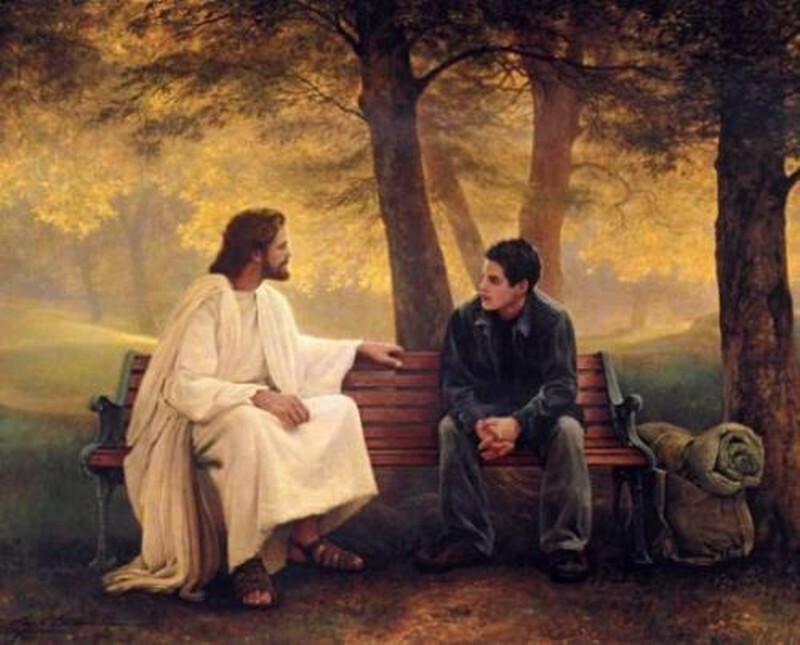 And when we yield to His Spirit, teachings, and guidance, we no longer need to ask, “Now, Lord, what is Your will?” Friends know each other’s will. Jesus has told us His will for us. He told us many things in His Word. Those are the things we are to obey. To obey this, we must form relationships with sinners and unbelievers. We must welcome them in our church. Also in these relationships, we must continually point them to Jesus Christ and His Word, not to ourselves. For if we become a necessity to someone else’s life, we are out of God’s will. As God’s friend, our primary responsibility is to be a “friend of the bridegroom”, Jesus Christ. We should not cause another person to be devoted to us, nor should we be more devoted to them than we are to Jesus. If they will not devote themselves to Jesus nor obey Him, we must stay faithful to being a friend of God and not compromise His Word to keep their devotion to us. Instead, we must continue to emphasize the Words of Jesus so they will eventually repent and become His friend. Beware of presenting only what Christ has done for you, instead of presenting Jesus Christ and the truth of His Word, which will point out their sin and need to repent. Otherwise, they will be left with this thought—“What a nice person you are!” That is not being a true “friend of the bridegroom”, for you are increasing all the time; Jesus is not. Our goodness and kindness should never draw people to simply become our friend, but should be magnets that draw people to become friends of Jesus Christ. If our kindness is not drawing others to Jesus, it is not the right kind of kindness; it is only a fleshly influence which diverts them from repenting of their sin and heading in the right direction. Furthermore, in doing this, we have become their friend instead of being a “friend of the bridegroom”. When that person we were ministering to sees the Bridegroom and hears His voice, we can gradually step aside until we are never considered again, because that person is now focused on Jesus Christ. That should be the goal of our ministry and it should be our joy when it happens. When you see a person who is close to understanding and believing the claims of Jesus Christ, you know that your influence has been used in the right direction. However, the demons, who have kept that person in unbelief and in sin, will also be at work in their life. Therefore, when you begin to see that person in the middle of a difficult and painful struggle, don’t try to prevent it, don’t compromise God’s Word, but pray that his difficulty will grow even stronger, until no power on earth or in hell could hold him away from Jesus Christ. Over and over again, we try to be the Holy Spirit in someone’s life. When we do, we are actually preventing God’s will and saying, “This person should not have to experience this difficulty.” Instead of being friends of the Bridegroom, our sympathy for the person gets in the way. Beware of rejoicing with someone over the wrong thing (i.e. an unwed woman announces cheerfully, “I’m going to have a baby!” and they expect you to rejoice). But always rejoice over the right thing (i.e. an unwed woman confesses, “I’m pregnant, please forgive me, and help me get my life back on track with Jesus while I raise this child.”). In the latter example, we can rejoice because the woman is willing to repent and listen to the Bridegroom’s voice. Abraham did not have a Bible because none of it had been recorded. He did not have a preacher teaching Him. All he possessed was an intimate friendship with God. He communed with God and did whatever God told Him to do. In short, that is what it means to believe God and be His friend—commune with Him in His Word and in prayer, and obey what He says. Our only job is to maintain an intimate friendship with Jesus Christ. Love for Jesus will cause us to keep His commandments. Most of our life is not spent in trying to be consciously obedient, but in maintaining this love relationship. So see that nothing interferes with it. Don’t even let church activities interfere with maintaining this intimate friendship with Jesus. Yes, church activities can actually be a means of diverting a person’s focus away from Jesus Christ if we are not careful. Instead of being friends “of the bridegroom,” we may be working against Him while we are busy doing things in the church instead of loving Him and one another, as He commanded. If we don’t understand that a friend of God loves and obeys Him, we are in danger of considering God a “buddy” and we lose our fear of Him. Then we act like He is someone we can disappoint, disobey, and who will look the other way. At that point, our “friendship” becomes an unholy relationship, and we actually become a traitor—an enemy of God. Psalm 25:14 The friendship of the LORD is for those who fear him, and he makes known to them his covenant. Jesus wants you to become His friend, because He earnestly desires to share the secret of His covenant with you. When He tells you His covenant and you understand its profound meaning and the depth of His love, it fills you with a desire to enter into it by giving your life to Him as He has given His life for you. Luke 22:20 And likewise the cup after they had eaten, saying, “This cup that is poured out for you is the new covenant in my blood. At the beginning of our Christian life, we are full of excitement about our new relationship with God. But later, we find that God wants to get us into an intimate friendship with Himself—to enter into a covenant with Him. It is like a marriage, we wed the Bridegroom and become one with Him. We take His Name. We follow His lead. He is our Head and we are His body, to do whatever He wants. We take on His character. We sacrifice our independence and live for Him. We trust Him. After all, God knows your secrets, and what will give you joy. What makes God so dear to us is not so much His big blessings to us, but the tiny things He does for us without our asking, because they show His amazing intimacy with us—He knows every detail of each of our individual lives. He wants us to know His secrets and to know Him like He know us. However, we will never know the joy of being God’s friend until we surrender in every detail of our lives. Yet self-surrender is the most difficult thing for us to do. We make it conditional by saying, “I’ll surrender if…!” Or we approach it by saying, “Well, I suppose I have to devote my life to God if I want to see Heaven.” We will never find the joy of self-surrender in either of these ways. But as soon as we do totally surrender, abandoning ourselves to Jesus, the Holy Spirit gives us a taste of His joy. When the Holy Spirit comes into our lives, our greatest desire and joy is to lay down our lives for our Friend, Jesus. Amazingly, at that point, the thought of self-sacrifice never even crosses our minds, because sacrifice is the ultimate expression of love. As we read at the beginning of this message, Greater love has no one than this, that someone lay down his life for his friends. Our Lord is our example of a life of self-sacrifice. He endured tremendous personal sacrifice, pain, and suffering for us, yet with overflowing joy. Hebrews 12:2 Let us fix our eyes on Jesus, the author and perfecter of our faith, who for the joy set before him, endured the cross, scorning its shame, and sat down at the right hand of the throne of God. If yielding myself in absolute surrender to Jesus Christ does not give me joy, then I have not surrendered everything, and my eyes are fixed on something other than Jesus. If there is no joy in my soul, after all Jesus has done, is doing, and has promised me, then I am focused on something else and the Holy Spirit is not in me. 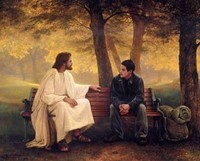 If Jesus is not the One to whom I am looking for direction and then obeying Him, then there is no friendship between us. In the end, it won’t matter if I say I am God’s friend or if I call myself a Christian. What will matter is my obedience to Him, because it will show that I truly believe in Him. Then He will call me His friend. We have a choice. We can become a friend of God or a friend of the world. We cannot be friends of both. The things of the world are attractive. The temptation is to fit in and enjoy popularity. However, the one true desire of a Christian is the Lord Jesus. Love for Jesus is not something sentimental or emotional. It is a life of obedience, loving others, and self-sacrifice. It is the most practical thing imaginable for living a joyful, peaceful, and blessed life. Christian, are you ready to become God’s friend? If so, repent of living for yourself and seek an intimate relationship with Him. Invite the Holy Spirit, every day, to take control and lead you. Talk with God all day long. After all, we talk a lot to our friends and we tell them everything. God wants to talk to you throughout the day and tell you what is on His heart, too. Read His Word daily and obey it.